Contact sports like AFL or basketball can result in a lot of accidental impacts to the head and mouth area. If you don’t wear a mouthguard, these impacts can result in damaged and broken teeth. A decent mouthguard will cushion your teeth, causing any force from accidental contact to be spread out, rather than focused on one tooth. This will reduce your risk of irreversible dental damage. Concussions are caused by sharp impacts to the head and neck area. 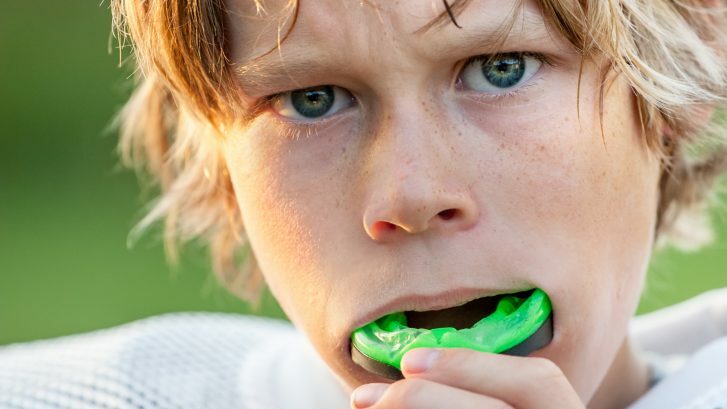 Although their primary purpose is to protect the teeth, mouthguards can also help reduce your risk of having a concussion if you are hit in the mouth or jaw. They are designed to spread the force of an impact, making it less ‘sharp’ and reducing the risk of it causing a concussion. As noted above, a mouthguard is designed to spread the force of an impact over a larger area, reducing the negative effects associated with it. Head and neck injuries are commonly caused by impacts to the mouth or jaw area from a stray elbow or knee, and their severity can be greatly reduced by wearing a mouthguard. If you were to get hit hard in the mouth or jaw, there would be a high risk of either a broken jaw or damage to your jaw joints. Both of these injuries will require a lot of care and rehabilitation time to recover from, and simply not exposing yourself to them in the first place is definitely the best option. Wear a high quality mouthguard to reduce the risk of a hit to the face turning into a damaging injury. They can save your wallet! Emergency dental treatment can be expensive, especially if significant damage is done. A lot of people either don’t wear mouthguards or they wear poor quality mouthguards because they don’t want to spend a lot of money on an expensive one. However a decent mouthguard is worth every cent, and you will be happy that you have one if you happen to get hit in the mouth while playing sport. If you have dental insurance, you also might not be covered if you aren’t wearing a mouthguard, meaning that you will have to pay for everything out of your own pocket. So, if you don’t have a decent mouthguard, buy one – it’s absolutely worth it!